A surface capturing method is developed for the computation of steady water–air flow with gravity. Fluxes are based on artificial compressibility and the method is solved with a multigrid technique and line Gauss–Seidel smoother. A test on a channel flow with a bottom bump shows the accuracy of the method and the efficiency of the multigrid solver. Wackers, J, & Koren, B. (2008). 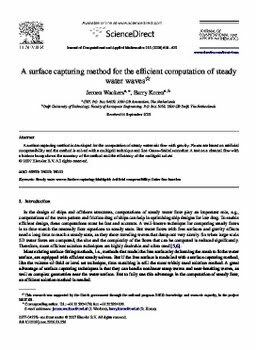 A surface capturing method for the efficient computation of steady water waves. Journal of Computational and Applied Mathematics, 215, 618–625.